mind and body are exhausted! smile confidently while doing it! like meditation without sitting still; in just 10 minutes! Are you struggling with stressors that sometimes feel like they are too much to bear? Do you find yourself tossing and turning and having difficulty getting a good nights sleep? Do you wish you were more productive and less irritable? Is your to-do list intimidating? Stress can negatively impact mood, emotions, and behaviour in addition to effects on the immune system, organs, and tissues. Are there times when it takes all your energy just to make it through the day? And you didn’t get everything done that you wanted? Balance can feel like a far-off dream. My life used to be overscheduled and out-of-balance. I experienced low energy, moodiness, poor-sleep, allergies, and aches and pains. And I was a holistic nutritionist! Once I introduced a regular moving meditation routine into my life, I began to feel ease, peace, and balance. My symptoms went away and now I feel happier and energised! As my meditation practice became more consistent, my life became easier and more spacious, and now even the busy times are more manageable. You move through your day feeling empowered and greet everyone with a smile. Your worries about your health are in your distant past. You feel energized when you get out of bed in the morning and still feel energized in the evening after work! You have enough patience to listen and respond to your spouse or kids. You make difficult decisions with confidence. Productivity in both your personal and professional life increases. You know you can handle any situation with calm and ease. Your stress is more manageable. Your body moves freely. You are happier and more content with your life. But really I want you to feel as amazing as I do! Sue is amazing! I cannot express my gratitude enough. I highly recommend working with her. I look forward to Sue’s guidance in the future! Sue’s knowledge and dedication to this practice will benefit all her clients and students immensely! I am so thankful to Sue for helping me restore the energy I know has always been there. Working with her has been a blessing! The 10-minute routine that will help you increase energy, reduce stress, and achieve balance! It’s like acupuncture without and needles. It’s like meditation without sitting still. The complete 10-minute guided video of Morning Mojo for you to follow from start to finish. Detailed video instructions on how to get the most of your Morning Mojo practice. BONUS! An mp3 Download of the complete Morning Mojo audio recording to take with you anywhere! Bonus for first 20 subscribers! stress and bringing on relaxation! Imagine how it feels to know you are taking charge of your health and emotions. You are grateful for fewer trips to your doctor. You awaken in the morning feeling refreshed and restored. Your physical body feels so good after your morning sequence and your mind is calm, centered, and clear. Your work is more focused and productive. Your relationships deepen and strengthen. You feel balanced in all areas of your life. You notice more beauty every day. You are happier and more content with yourself and your life. You will then create your own username and password instantly giving you exclusive and lifetime access to the Morning Mojo Program! The first 20 people registered will receive a bonus audio meditation in a separate email! YES! GIVE ME FULL ACCESS TO MORNING MOJO! Thank you so much, Sue, for creating such a wonderfully simple, but effective, solution! I wanted to do something each day to energise both body and mind, and to lower my stress levels, before sitting down to a day’s work, but I was time poor. As someone who works from home, the 10-minute duration and focused routine really suits me and my impatience to ‘get on’ with my other priorities! When I saw that people who normally can’t sit still long enough to get the benefits from traditional meditation would like it, I knew it was for me. The quality of the video is excellent visually, the audio clear and the site really easy to use – and the Qigong routine is clearly presented and easy to follow. Fantastic! Director of Key to Learning at Home Ltd, Key to Learning at Home Ltd.
How will moving meditation benefit me compared to sitting still? Moving meditation actually assists you in moving energy throughout your physical body. This helps open up blocked channels and helps heal physical pain, detoxify the body, and strengthen muscles, tendons, and ligaments. Also many people find it easier to focus when they are gently moving their body compared to sitting still. How could something that takes only 10 minutes be so beneficial? The movements you will be learning are very powerful. Energy flow is based on your focus and concentration! It does not take hours of dedicated meditation to experience significant changes in your health and your life! Why is the price so low? Will it be increasing? I want as many people as possible to experience this practice and the subsequent benefits. Once the doors close I will re-evaluate my pricing! Take advantage of this low price now! I have physical limitations, will I still benefit? Absolutely! If you have difficulty standing, you can be seated the entire time. You will still benefit by visualizing the movements. The movements are very slow and gentle. They do not require much flexibility. There are no awkward or stretching movements. If you have concerns, please check with your doctor before starting this program. How rigorous are the movements? The movements are very slow and gentle. They do not require much flexibility. There are no awkward or stretching movements. Qigong is a meditation practice with its roots in ancient China. Qi (pronounced ‘chee’) means energy, and Gong means movement. You are moving energy throughout your invisible energy channels (meridians) in your body, opening up blockages and restoring the normal energy flow. This is not a religious practice. If you are a religious person, you can use this practice to enhance or deepen your spiritual beliefs. If you are not a religious person, you can simply relax, smile, and feel wonderful healing energy flowing through your body! My mind is too busy to meditate. How will this different? Meditation is not about chasing thoughts away, it’s about being quiet in the moment, feeling stillness in your body, and observing your breath. The slow movements give you a focus which you may not have experienced in the past. Most people who say they cannot meditate find this practice very doable and rewarding! Really? If you can’t find 10 minutes in your day to put yourself first and care for your health, then get up 10 minutes earlier! If you still can’t find 10 minutes then this program isn’t for you! After going through Sue’s course and learning about the Qigong (moving meditation) practice, I can honestly say that this is one of the best things I’ve ever done for myself! Practicing Qigong has brought me such balance, peace, and ability to manage my stress. I am waking up less in the night; my menopause symptoms are virtually gone. I feel truly supported, physically, mentally, spiritually and emotionally, on my journey for optimal health. 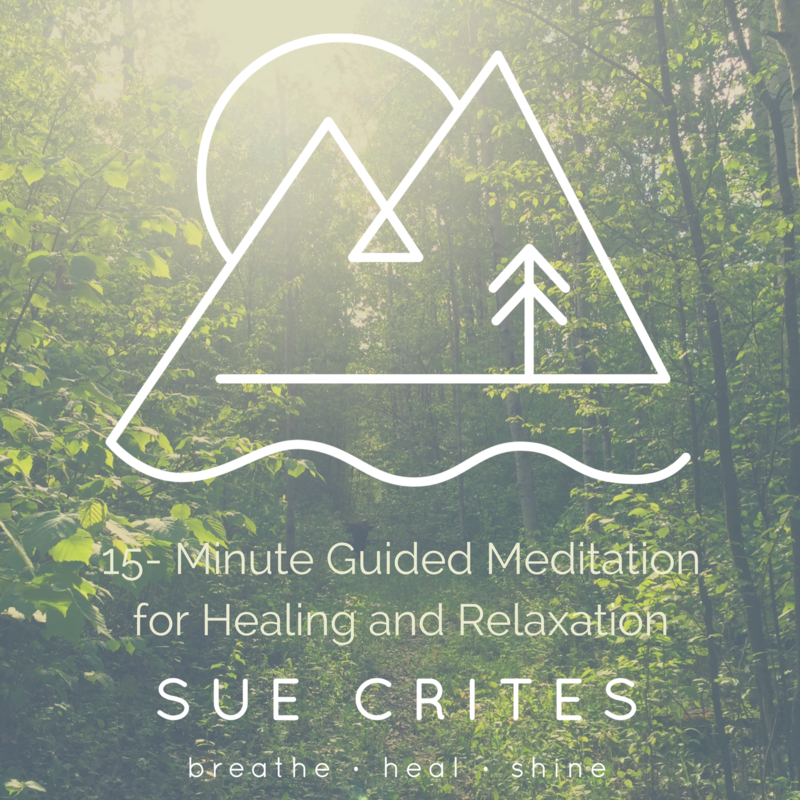 I have found it easy to visualize and experience the energy movement in my body by listening to Sue’s guidance. The energy is full of love and has encouraged me to continue to practice Qigong on my own regularly. I feel less stress daily and more balanced!